Dr. DeJarra K. Sims NMD, known by her patients as “Dr. DJ” is a Naturopathic Physician and published author of the book, “Your Healthiest Life Now: The Key to Your Total Health Transformation”. Dr. DJ is licensed to practice medicine in both Arizona and California. She received a Bachelor’s degree in Biology from Prairie View A&M University, in Texas and completed her doctorate at Southwest College of Naturopathic Medicine, in Tempe, Arizona. In addition to her training in natural therapeutics, Dr. DJ trained in Traditional Chinese Medicine and Acupuncture (TCM), Minor Surgery, Prolotherapy and Osteopathic Manipulation. Dr. DJ currently serves as an Assistant Professor of Naturopathic Medicine at Bastyr University in San Diego, California where she specializes in the natural treatment of skin disorders such as acne and eczema. She has special interest and extensive training in the treatment of drug addictions, heart disease, thyroid disorders and digestive disorders. Dr. DJ is a professional speaker and natural health expert and serves as an advisor and guest speaker for various national, community and faith based organizations. 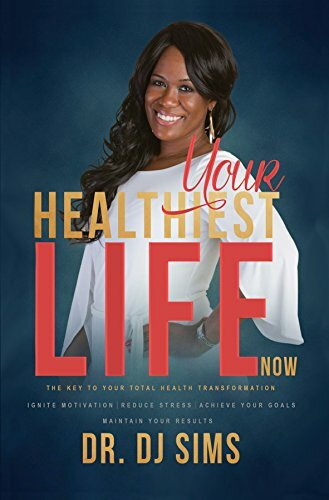 Free Downloads from "Your Healthiest Life Now"
Your Healthiest Life Now by DeJarra Sims, as the author says, is not just another diet book; it is more about how to prevent becoming unhealthy in the first place. It discusses prevention of a large variety of problems including heart disease, looks at the ways we can control obesity while enhancing our immune systems, as well as provides a good collection of check lists, tips, sample menus, and quiz questions for easy assimilation. The author puts forward a rather revolutionary suggestion - consider food as merely fuel, “like the care we take while fueling our car, where we do not forget to insist on correct fuel, why can’t we treat our body with the same respect, always telling ‘no’ to inexact food?” The whole book is written in question-answer format with many other aspects of health, such as the why, when and how of body supplements, stress, as well as a thorough discussion about health care providers becoming a part of the questions and answers.